Low intermodulation design and optimized return band prevents high cable modem signals from affecting forward band transmission. 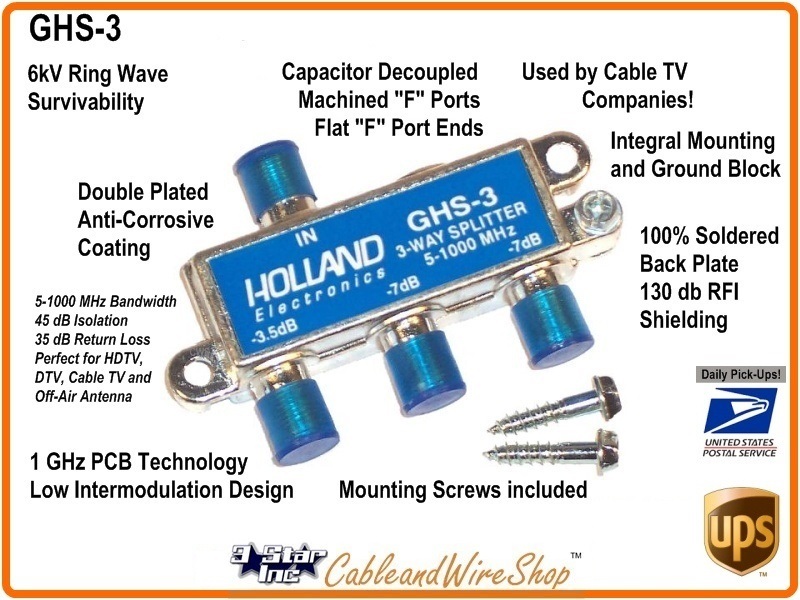 Therefore, the GHS-3 series digital Splitter Is ideal for present and future multimedia applications including video, telephony, and transmission sensitive digital signals such as QPSK and QAM data. Ideal for digital and cable modem applications with high surge resistance and unique plating for unmatched corrosion resistance to withstand harsh environments. One Low-Loss Output (-3.5 db) and Two Low-Loss Output (-7.0 db, -8.0 db max.) Ports for different drop length applications. Great transaction, great seller. Highly recommended. AAA+++ Thanks again.